UOPETA flicked the external switch to close the door behind us, hiding it again afterwards by placing a large rock in front of the opening. Form here we would have to make our way down and around the cliff mine to the South where we had hidden the boat after using it the last time. Let's just hope that firstly, that it was still there after all this time, and secondly, it was still in a good enough condition to use safely. I am very proud of my handiwork when I finished that boat, and I even impressed myself when I waterproofed it using tree resin. Logically that boat should last us years! Then again, I did have to saw it into two pieces once to be able to drag it from one side of my wall to the other. That was likely to weaken its structural integrity, but we had used it quite a few times since and we hadn't sunk yet, even with three of us in it at once! "So, uh Syeonyx? Have you and Amie got something going on between you...?" As soon as UOPETA mentioned Amie's name I couldn't help but think back to the kiss we had shared back at the base entrance... She was... So many things; beautiful, intelligent, witty, fun... We had shared a few moments together now, and I was beginning to think something was going on between the two of us. But I thought it was a little early to say anything to anyone else just yet. Although it seems everyone else is quite good at observing the obvious; we had hardly kept the small moments between us a secret. I mean, why would we? We had nothing to hide, nothing to be ashamed of. "Well...? Yes, no, or is it complicated...?" We've had to call it a day a little earlier than initially intended. At about the quarter way point, we swapped over and I was put in the rowing seat. I wasn't bothered all that much as it was a boring task that allowed me to purposely think about other things. I could just sort of set my arms on autopilot and let my mind wander, like I had done so many times before. Within minutes of beginning, I was thinking about Amie already, and again I felt alone, despite THEROS and UOPETA being less than three feet away from me. Being away from her almost made me sad, and it was then that I truly realised that I did have proper feelings for her. I just hoped that she reciprocated... Within an hour or so of rowing from the quarter way point, it began to rain, rather heavily. It wasn't anything we hadn't encountered before, but as we neared the halfway point, the water began to get rather choppy, and UOPETA seemed concerned about ending up capsizing... THEROS scanned his map for any areas close by where we could make camp, and the only logical place was about fifteen minutes further South. 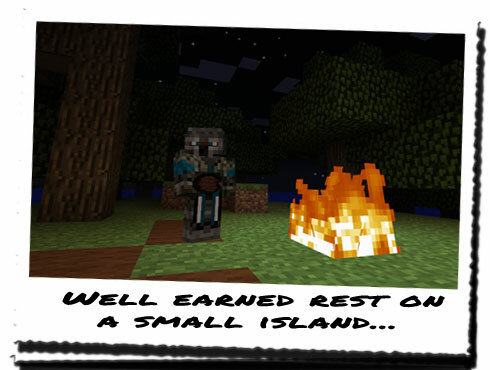 It was a small island out in the middle of the water, so it was highly unlikely any HoN Co. guards were there. I battled the currents for a further ten minutes before the island came in to view. Not wanting to gun it and risk turning us over, I took it slowly. We were soaked by the time we reached the island, so when we jumped out to drag the boat on land we weren't fazed at all. We quickly secured the boat and sought shelter in the trees a little further along. Once there, THEROS immediately got a fire going beneath the canopy of a large tree. This would prevent the fire being put out by the torrential rain. But as luck would have it, as soon as the fire began to gain strength, the rain stopped almost as quickly as it had started! "Good job this island was here. We'd have had a right job trying to land the boat along the shore. The rain was driving North, so this island broke the force of it enough for us to get here." "Can I be the first to say I'm not a fan of boats... Not now anyway..."
UOPETA went into his bag and fetched out a few bits and pieces, including a feet slabs of meat, which he put onto the fire. Within minutes the sweet smell of cooked beef began to waft our way. We too were also gaining benefit from the fire, as we were beginning to dry nicely. "We've got tomorrow to look at the tower. Hopefully we get there with no further issues. Let's just hope that either us or SERVERE find something about the Eyes we're meant to find. Or we're stuck..."
The many signs of HoN Co.
Day 138: Good 'ol days!